The Michigan Translational Research and Commercialization for Life Sciences Innovation Hub is a statewide program supporting translational research projects in life sciences with high commercial potential, with the ultimate goal of positively impacting human health. Innovators from all schools at the University of Michigan, other institutions of higher education, non-profit research centers, and hospital systems across Michigan are eligible to submit projects for funding consideration. The program offers early-stage funding opportunities through Mi-Kickstart, and Mi-TRAC is our funding program for mid-stage commercialization projects. MTRAC for Life Sciences Innovation Hub/Mi-TRAC/Mi-Kickstart have awarded millions of dollars in funding over the past four years. CLICK HERE to see our Project Awards. The MTRAC for Life Sciences Innovation Hub is co-managed by the U-M Medical School’s Fast Forward Medical Innovation Program and U-M Tech Transfer. It has an operating budget of $4.05M, with half of the funds coming from the State of Michigan’s Michigan Strategic Fund (MSF) and the remainder coming from participating institutions. The program reinforces the commitment of the MSF, the Michigan Economic Development Corporation, and the U-M to entrepreneurship as a dynamic catalyst for economic growth, allowing for greater collaboration and ultimately increasing the number of start-ups, jobs, industry licenses, and investment for Michigan. What is the background of the MTRAC for Life Sciences Innovation Hub? 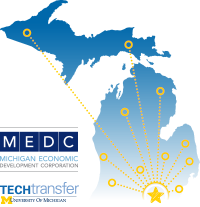 In 2012, the Michigan Strategic Fund approved and created, with program oversight by the Michigan Economic Development Corporation (MEDC), the Michigan Translational Research and Commercialization Program to provide grant funding to eligible applicants. Its objective was to accelerate the transfer of technologies from Michigan’s institutions of higher education to the private sector for commercialization of competitive edge technologies. The MTRAC for Life Sciences Innovation Hub is an expansion of this very successful initiative, a new statewide program that will be co-managed by the University of Michigan Medical School’s Fast Forward Medical Innovation Program and U-M Tech Transfer. Who can submit proposals to the MTRAC for Life Sciences Innovation Hub? Innovators from all U-M schools, as well as other institutions of higher education, non-profit research centers and hospital systems across Michigan are eligible to submit projects for funding consideration to the MTRAC for Life Sciences Innovation Hub. Why is MTRAC expanding to a statewide program? Leveraging the success of the original MTRAC for Life Sciences program and the portfolio of biomedical innovation programs from FFMI, establishing a statewide hub allows for greater collaboration with industry partners, institutions of higher education, nonprofit research centers and hospital systems across the state as it relates to advancing competitive edge technologies and bio economy technologies into commercial applications. Ultimately, this will help increase the number of start-ups, jobs, industry licenses and investment for Michigan. How much will be in the fund? Over what time period? The MTRAC for Life Sciences Innovation Hub has been approved by the State with an initial operating budget of approximately $4.05M, with half of these funds coming from the Michigan Strategic Fund (MSF) and the remainder coming from partner institutions. The Hub will have an annual budget approval process from the MSF. What is the process for submissions of proposals? Proposals will be accepted from investigators at any Michigan institute of higher education, non-profit research center and hospital system. The MTRAC for Life Sciences Innovation Hub offers two funding tiers – “Mi-Kickstart” awards offer early-stage funding in the $25K-$30K range, and “Mi-TRAC” awards offer mid-stage funding in the $100K-$200K range. Mi-Kickstart awards are given quarterly, with proposals for these early-stage awards due February 1, May 1, August 1, and November 1 of each year. Mi-TRAC awards are given once a year, with proposals for these mid-stage awards due September 2017. The MTRAC for Life Sciences Innovation Hub is using the University of Michigan’s Competition Space to manage the proposal submission process for both Mi-Kickstart early-stage and Mi-MTRAC mid-stage awards. Proposals will be evaluated on the basis of scientific -merit, potential health care impact and significance, the potential for commercialization, and the likelihood of obtaining further support. It is highly recommended to contact Michelle Larkin, MSE, MTRAC Program Director & Sr. Biomedical Innovation Specialist (michcote@umich.edu or 734-615-7886) to discuss your proposal before submission. The MTRAC for Life Sciences Innovation Hub provides resources to support translational projects in the life sciences with high commercial potential. Funding focuses on four specific market segments, or “verticals”: devices, diagnostics, therapeutics and healthcare IT. Mi-Kickstart early-stage awards fund preliminary studies, development activities, and milestone setting. Mi-TRAC mid-stage awards include funding for proof-of-concept and late-stage translational studies, regulatory guidance, business plan development and mentorship from industry and investment experts. Have questions about the MTRAC for Life Sciences Innovation Hub? Contact Michelle Larkin, MSE, MTRAC Program Director & Sr. Biomedical Innovation Specialist, at michcote@umich.edu or 734-615-7886.